High Street favourite Strada wanted a fresh destination for their applicants following their re-launch in 2014. WDAD were asked to design and build a recruitment website with a client accessible content management system that truly reflected their employer brand. In 2014 Strada was re-launched following an management buy-out from parent company Tragus (a long-standing WDAD recruitment advertising client). There was a new impetus behind the brand with extensive menu changes to focus more on core Italian dishes and ingredients. We were asked to design and build a careers site that reflected this emphasis on authentic Italian cuisine and would attract people with a ‘passion’ for the Italian food. The design needed to work in tandem with the new corporate ID, have a client-accessible content management system and seamlessly link with their new applicant tracking system. We designed a recruitment website around the sights, smells, sounds, tastes and feel of the new Strada – ‘A feast for the senses’. We used imagery and language to explore how Strada could offer careers that stimulated all five senses. A photo shoot was arranged at the flagship restaurant at Tower Bridge and we coupled those images with evocative shots from the brand new menu. We conducted an extensive round of brand research, conducting telephone interviews with Strada employees to produce profiles of all role types and snap-shots of what the ‘new’ Strada meant to the teams. The site content continued the senses theme and we built a bespoke WordPress platform that was fully responsive for desktops, tablets and mobiles and allowed the client easy access to the back-office so that changed could be made in-house (and future amendment charges avoided). Finally it was integrated with the client’s ATS so that latest jobs were featured prominently on the home page and a live jobs location search feature added. 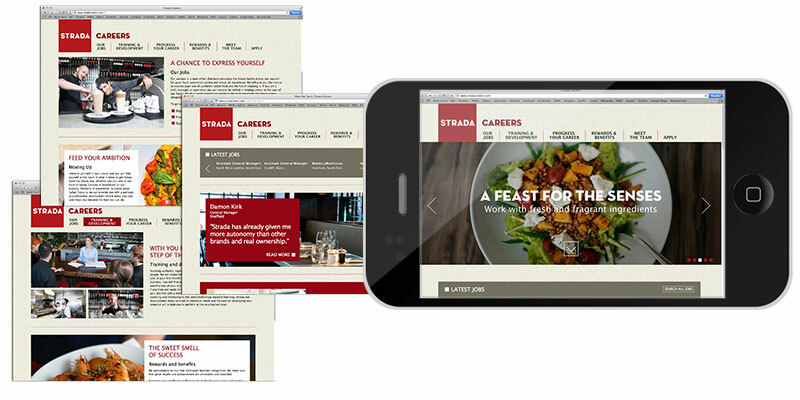 The careers site launched early in 2015 and www.stradacareers.com continues to successfully convey the essence of a career at Strada. It’s rightly at the heart of all recruitment activity across the business, with the brand re-establishing its place as one of the High Street’s favourite and most trusted names.